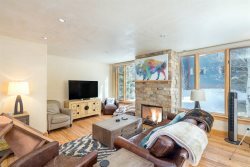 Downtown Telluride penthouse condo with a large deck & open floor plan. Great location-close to everything! Ice House 418 is a spacious 2 bedroom, 2 bathroom penthouse condo, conveniently located just a block and a half from the base of the Gondola/Lift 8. The condo is also a short walk to the River Trail and all that downtown Telluride has to offer. Relax on the large deck, or by the common pool and hot tub after a long day of adventuring. Beautiful property with a location that is convenient to most everything.